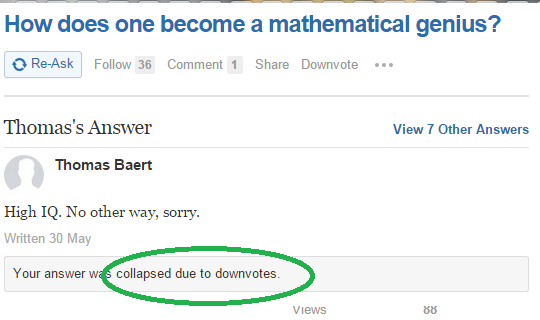 As evidenced by the down-votes for this Quora answer to the question How Does One Become a Mathematical Genius, many people wish to live in a world where either IQ does not exist or, if it does, it doesn’t measure anything important and is of no predictive value for success at life. It’s easier, perhaps more comforting to create an alternate reality than confront our existing one. According to the biographies I have read, all mathematical geniuses displayed precocity – maybe not directly in mathematics – but all were very talented from a very young age. It’s not like you can be a dull 20-something with no outwardly obvious signs of intelligence and, then suddenly, through ‘deliberate practice’ transform into math genius, sorry. Although I’m open to the possibility of being wrong, I don’t don’t think its possible to be a math genius with less than a 120 IQ or so. Of course, the word ‘genius’ can be subjective, but if you need an IQ of around 100-115 to at least graduate from college, I imagine you would need a much higher IQ, still, to become a ‘mathematical genius’. What Makes Taneshi Coates Special?